The closure of a Ugandan radio station has been condemned by opposition politicians and media groups. Politician James Otieno told the BBC the move was "unacceptable", while the Uganda Journalist Association said the government had exceeded its powers. KFM was closed after it aired a heated debate on the possible causes of the helicopter crash which killed Sudanese Vice-President John Garang. Uganda's president had warned the media not to report speculation on the crash. 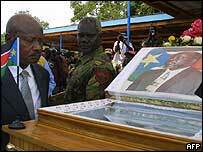 Mr Garang was travelling in the Ugandan helicopter when it crashed taking him back to Sudan after meeting Mr Museveni. The Ugandan crew were also killed. Information Minister Nsaba Buturo said KFM's licence had been suspended because of a programme that did not meet Uganda's broadcasting standards. He denied the closure was an attack on press freedom. "Freedom without responsibility is dangerous to a young democracy such as ours," he told the BBC's Focus on Africa programme. 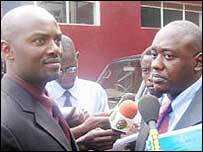 But the Uganda Journalist Association (UJA) said the Broadcasting Council did not have the powers to close KFM. "The action is not part of the functions of the council under the law as its mandate is to arbitrate and resolve disputes anybody has with the electronic media," said UJA Secretary General Haruna Kanaabi. Mr Otieno told the BBC the decision showed that Mr Museveni was intimidating the media at a time when Ugandans wanted more political freedom. "People have a right to question," said Mr Otieno - who is based in London and a member of the former ruling Uganda People's Congress. The head of the media group which runs KFM said he would "pursue all available avenues" to return to the airwaves. The closure was "unreasonable and illegal", Monitor group head Conrad Nkutu told the AFP news agency. President Museveni has described some journalists as "vultures"
The programme was hosted by prominent journalist Andrew Mwenda - who was singled out for criticism by Mr Museveni over his articles in the Monitor newspaper, part of the same media group. Mr Museveni had said publishing conspiracy theories about the crash constituted a threat to national security and would not be tolerated. "They are vultures," he said of the papers in question. "For them the misery of the many is the joy of the vultures. "Now, any newspaper which plays around with regional security, I will not tolerate it. I will just simply close it, finish, the end." However, he has been one of the few public officials to say he does not know the cause of the crash - others have said it was definitely an accident.